When Apple launches a product, it’s an event. The stuff that comes out of Cupertino is, more often than not, so intriguing, so innovative, and so eye-catching that you want to get your hands on it as quickly as possible. And if that means spending a night camped out in front of an Apple Store just so that you can be among the select few to get your mitts on Apple’s latest products, well, how can you pass up that opportunity? Fairly easily, if you’re us, actually. Because we have interns to wait in line for us. Yes, we dispatched Macworld editorial intern Blair Hanley Frank to the Apple Store in Walnut Creek, California for 12 hours of dodging drunken passersby, watching street-sweepers, and eyeballing every last change taking place inside the store just so that he could be among the first to grab a new iPhone 3G S. And because Blair is a card-carrying member of the Twitter generation, he fired off updates to us in short 140-character bursts. June 18, 4:26 p.m.: Well, I’m headed out of the office, onto BART, then home to change and grab my stuff, before heading to the Apple Store to camp out. Woohoo! 7:20 p.m.: Alright, All staked out. First in line. They’re saying I’ll be first in tomorrow morning. Yeehaw! 7:37 p.m.: Still nobody here. Saw someone with pajamas and a sleeping bag, so maybe he’ll be a fellow camper this evening. 8:04 p.m.: I’m now a minor celebrity. The store manager just came out to take my picture. I feel special. 8:04 p.m: There are now two members of the concierge staff standing at the front door with an iMac, purposes unknown. 8:35 p.m.: Finally got someone here to join me. Now it’s two teenage guys in chairs, sitting around. 8:36 p.m.: Also, that iMac was just waiting for some old people to come pick up. False alarm. 8:40 p.m.: The one problem with sitting outside: The smokers. Blech. 8:44 p.m.: Manager brought in what looks like 6 dozen doughnuts. Looks like we’ll have breakfast tomorrow! 8:58 p.m: I may be counting my chickens, but I’ve already started downloading a host of apps for my new iPhone. 9:06 p.m.: Well, it’s 9:06, and the store has shut its doors. Just some last purchases, and then everyone’s out of here. 9:18 p.m.: Last concierge on the floor has exited. Things are really winding down here. Now it’s the long wait. 9:30 p.m.: Well, all of the customers are gone, and they’re wheeling in a case full of strange white boxes…ooo! 9:45 p.m.: Okay, another person has joined our motley crew. Now four dudes waiting in line. 9:52 p.m.: Aaaaannnnd, the laptops are getting put away. It’s pretty clear this place is going to be iPhone central. 10:08 p.m.: Massive display dismantling going on. Locks are coming off, cables are hanging everywhere, it’s Apple Store Unrated and Uncut over here. 10:11 p.m.: And the front of house displays are coming down. Strings of app icons, BEGONE! 10:17 p.m.: It’s amazing, how bunches of people out to go clubbing are walking past us, and here we are, a bunch of shabbily dressed nerds. 10:42 p.m.: Parade of drunk people is starting to get annoying. One of the disadvantages of this location. 10:59 p.m.: Someone (who I think is the asst. manager) said HQ is sending emails on the hour, every hour. 11:04 p.m.: Fire Truck just ran through here. That was loud. New display components are coming out of ridiculously large tubes. Eek. 11:38 p.m.: Ridiculously large banner has just been unrolled, and…It’s white. oops. Guess it’s not all the way open. 11:53 p.m.: Brilliant observation of the evening: Drunk people talk way too loudly. If only these people had gone to the Apple Store in Walnut Creek instead of the San Francisco store. Then they could have waited in line with a Macworld editorial intern. June 19, 12:04 a.m.: And, the banner is fully together! 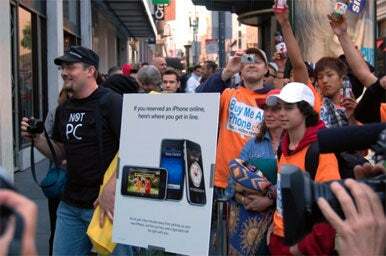 It reads: iPhone 3G S Meet the fastest, most powerful iPhone yet. With video recording and voice control. 12:06 a.m.: Now, the employees are having a pow-wow about the banner. Apparently, the logo’s too low. Oops. 1:15 a.m.: Well, the acrylic displays are coming out, and things are getting hooked up. T-minus 5 hours, 45 minutes! 1:40 a.m.: The display phones are up and running! T-minus 5 hours, 20 minutes. 1:55 a.m.: And the Apple Store employees are watching Family Guy. 2:08 a.m: And here come the drunks. 2:09 a.m.: T-Minus 5 hours and counting. Activity inside the store has roughly died down for now. 3:31 a.m.: OOO! Big ‘ol poster just got pulled out. Correction: multiple posters. And they’re big. Really big. 3:45 a.m: Well, the wires are looking tucked away, and there are more acrylic stands up. Things are looking pretty prepped. T-minus 3h 15m. 4:19 a.m: Streetsweeper’s here! iPhone isn’t. At least not yet. 4:30 a.m.: Well, it looks like we’re starting to get a pretty legit line out here. Only 2 and a half hours to go! 5:07 a.m.: We’re under two hours now. The store is looking very well put together. They’re even bringing out breakfast for us to munch on. 5:11 a.m.: Another delivery by Apple Store staff. Looks like more noms. Tons of noms here, that’s for sure. 5:19 a.m.: Giant iPhone by the door has a new running advertising animation for the 3G S.
5:22 a.m.: Due to lack of pre-reservations, I have been demoted to second class. Oh well. 5:27 a.m.: The sun is coming up on our motley assortment of geeks. At this point, we number about 20. 5:30 a.m.: Aaaaand they just broke the street date for one of their own employees. Well ain’t that just fancy? 5:31 a.m.: And again with the broken street time. Another plainclothes employee leaving with a 3G S.
5:35 a.m.: Now people are getting punchy. There are clearly iPhones, they are clearly here, and they are clearly available. Why can’t we have them? 5:37 a.m.: Employees came by carrying coffee. DO WANT. 5:43 a.m.: Heeere’s Streetsweeper Round 2! GO! 5:46 a.m.: Oh dear. Some dude got punted since he’s not the primary on his family account. 5:52 a.m.: Reserve line growing by the second. Rawr. 5:55 a.m.: Tons of staff in store. I think they match us 1 to 1 in there. 6:00 a.m.: And they’re now bringing the OJ and coffee around. Line of pre-registrants continues to grow. Rather sad, really. 6:14 a.m.: All employees now engaged in dusting. Also, a TensaBarrier maze has been constructed for us. 6:26 a.m.: And, they brought around bagels. Yaay! 7:00 a.m.: Made it inside! Getting the phone now. 10:39 a.m.: Now using my new iPhone 3G S to Speedmark a MacBook Air. Death to Unitaskers!